T.U.B Investing: Take A.I.M. - Let's Hit Bullseye Together! Take A.I.M. 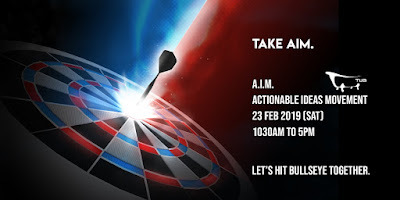 - Let's Hit Bullseye Together! How do you feel after attending a course/workshop? Do you follow what was taught? Do you gain anything from the course? Did you take any action after the course? These are the questions I kept asking myself after presenting various workshops and courses to the participants. I always wonder if the participants gain anything from the workshop or even wondered if they took any actions? Thus, I have been wanting to design a course where I am certain the participants had gained from it and took some actions. After all, I believe that should be the main reason why a participant will want to attend a course! So after many months of planning and discussion with readers, I had finally came up with A.I.M., which meant "Actionable Ideas Movement". A.I.M. is a new course – Actionable Ideas Movement – that is designed by me..
(2) by the end of the course, we hope participants will be able to invest in HK and US Markets with comfort and the right mindset. 1. The course will allow participants to ask questions beforehand. These questions will be answer during the course. 2. The course will also allow participants to provide 1 stock in the US and HK market each for me to analyse beforehand. These stocks will be reviewed during the course. 3. There will also be a weekday evening FOLLOW UP SESSION 6 MONTHS LATER to review on all the ideas that was discussed (No extra payment required). - A Discussion of various HK and US companies that You Requested! If you are interested in this event, do sign up via this LINK. I will only be limiting the course to a maximum of 15 pax. Do note that once you sign up, an email will be sent to the email address you registered with Eventbrite for the questions and the stocks you will like me to discuss during the session. I look forward to meeting you at the event! Oh... and do remember, please like our Facebook page (T.U.B Investing) and follow me on InvestingNote. Thanks for your comments. I will try my best. Give This Unicorn A Miss! I Sold All Of It! Take A.I.M. - The Singapore Market Version! The information stated in T.U.B Investing should not be used as a reference to buy or sell any securities, assets or commodities mentioned. Readers should carry out their own due diligence and verification of the information provided. The owner of T.U.B Investing is not liable for any loss arising directly or indirectly as a result of actions taken based on ideas and information found in this blog.